During the last eight years of my La-Z-Boy life I have had the pleasure of planning and organizing many events and parties. Nothing has brought me as much joy as planning our family dinner for the Ronald McDonald House. 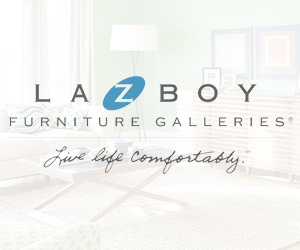 La-Z-Boy Furniture Galleries is the official furniture provider of Ronald McDonald House Charities and we are so proud to support them both locally and nationally! Last year Ronald McDonald House moved into a new state of the art house located directly behind BC Women’s and Children’s Hospital. They went from being able to assist 13 families at the old house to 73 families in the new house. They offer families a comfortable place to stay while their child receives treatment at Children’s Hospital. At least three nights a week the house provides ‘family dinner night’. This means that those living in the house can get a hot, free meal fed to them without having to worry about anything. The reality is that the family dinner time can be some of the best times these families have had all day, week or even month. They don’t have to worry about the extra financial burden of picking up groceries, cooking or even cleaning up. It allows them to spend more time focused on healing. I began what seemed like a daunting task of cooking for 100 people with a brain storming session with some co-workers. We were able to come up with a fantastic menu and activity for the kids. We used fall as our inspiration and embraced a ‘from farm to table’ theme. Farmers sausage, soup, baked potatoes, salad and of course pie – boy was it a hit! The best feedback we received from a few of the parents who have been at the house for over three months was, “this is the best meal we have had so far.” I cannot describe the feeling that it gave me knowing we could do something so simple and have it make such a difference in their hectic days filled of hospitals, treatments and procedures. We had 15 volunteers from La-Z-Boy Furniture Galleries assisting with dinner and I must say of all the events I have organized, this one was the easiest to plan and execute because I had such a great team helping me. It was truly amazing how we all worked together seamlessly. We knew what needed to get done and did it! It really wasn’t a daunting task at all in the end and it is something we are looking forward to doing at the very least quarterly. As I reflect on our dinner I am truly moved by the strength of all of the parents and children currently living in the Ronald McDonald House. It makes some of the stuff I worry about on a daily basis seem so minuscule and really puts things into perspective. Health is one of the biggest keys to happiness. One of the values of Ronald McDonald House is “we value the healing strength of families” which was SO present in the house during family dinner time. I feel truly blessed to be part of the La-Z-Boy family and to be able to grow our partnership with the local Ronald McDonald House they do amazing things and I am so proud to be a part of that even if it is only for a few hours!